This city’s top dog in Animal Services has offered a potentially life-saving reprieve for a pit bull-mix on death row in Toronto. The doomed dog, Ginger, was injured a fight with a shepherd-border collie mix named Buddy in Toronto in November 2005. Buddy’s owner, who is the mother of Ginger’s owner, was also hurt. The city of Toronto was granted a destruction order for Ginger under the Dog Owners’ Liability Act three years ago. Earlier this month, in an appeal to an appeal, an earlier decision was overturned and the destruction order reinstated, with the courts saying “pit bulls are inherently dangerous animals that pose a risk to public safety by their very presence in public places.” That leaves the city with no choice but to follow through on the order, Kim Smithers with Toronto’s animal services told the Sun. “Unfortunately, it’s a provincial court order we have to follow,” she said from Toronto Wednesday. “There’s no opportunity for other options.” There may, however, be other legal avenues pursued by the owner, Philip Huggins who is said to have his dog in a safe place while he looks into his options. One would see Ginger sent to Calgary. Bill Bruce, head of animal bylaw services in this city, met Ginger on a recent business trip to Toronto and said he offered to bring her to Calgary where, unlike Ontario, there is no ban on pit bulls. He said the move would be at no cost given rescue shelters would cover any expenses and he’s confident the dog would pass behaviour tests and be a candidate for a new home. Wednesday he said he was waiting on word as to whether the offer was a viable option. Ginger was confined to an animal shelter in December 2005 when Huggins was facing charges under the Dog Owners’ Liability Act — charges that he was ultimately acquitted of. In 2007, the city of Toronto was granted an application to have Ginger destroyed under the Dog Owners’ Liability Act. By last year, the then seven-year-old pit-bull-Labrador retriever mix had spent half her life in the city-run animal shelter with her plight garnering much public support. 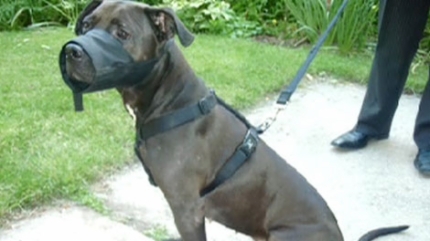 Ontario’s province-wide breed-specific ban on pit-bull type dogs came into effect in 2005.